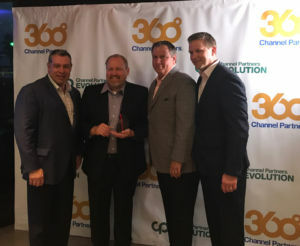 AUSTIN – September 27, 2017 – Channel Partners, a resource for indirect sales channels offering IT and telecom systems and services, is pleased to announce that Carrier Access, Inc. has been selected as a winner of the 2017 Channel Partners 360⁰ Business Value Awards. Twelve winners were honored during an awards reception on September 26 at the Fall 2017 Channel Partners Evolution in Austin. Carrier Access, Inc. is an industry leading IT managed service provider supporting 4,000+ clients with over 40,000 locations. From desktop to data center, their three practice areas are Connectivity, Technology, and Lifecycle Solutions. Carrier Access, Inc. can design, deploy, and support solutions that align with clients’ business goals. Founded in 1997 and serving over 4,000 customers in North America, Carrier Access, Inc. is a premier technology solutions provider serving customers from the SMB to Enterprise market. With a suite of products centered around Connectivity, Technology and Lifecycle Management solutions, Carrier Access, Inc. has the expertise to surpass customer expectations and help organizations achieve tremendous success. For more information, visit www.carrieraccessinc.com.